my first, freshly dyed-up hand spun skeins! gloriously nubbly and unintentionally thick and thin, which I'm told is quite the fashion. 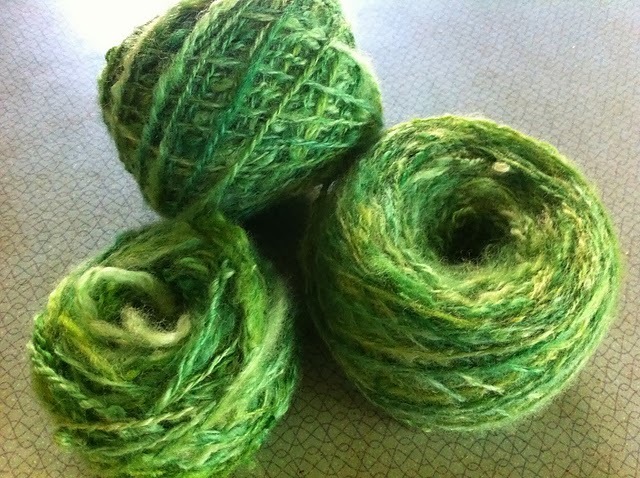 I used some landscape dye shades fern and chamomile. 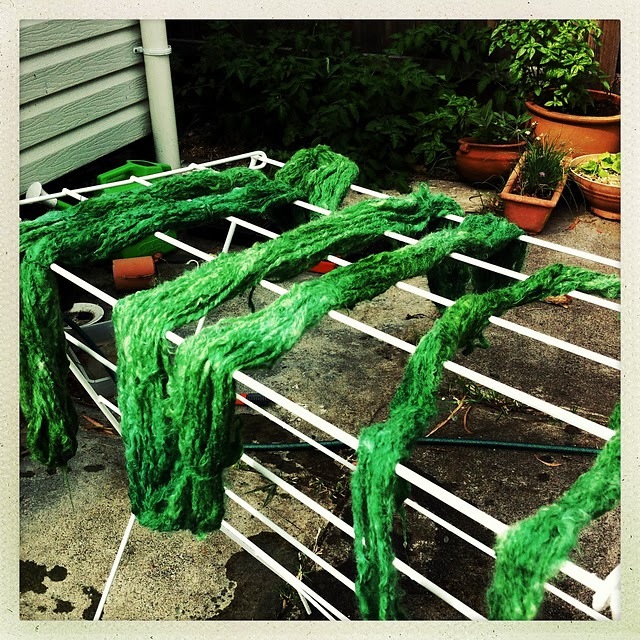 First time dyeing wool too, and oh sooo much fun! my knitting::the annabel pullover in misti alpaca tonos worsted (leatherly), almost done. I'm modifiying it, because the length in the pattern was too short for my kidney-conscious girl ("I want it to cover my kidneys...wow), and she wants length. my idea is to add a rib in another colour, either grey or bird egg blue...I'm knitting the sleeves in the round using two circular needles. I found this book at an op shop. Pearl S Buck's The Big Wave. As soon as I saw it, I was struck by what I can only call a memory-feeling or feeling-memory. I can't remember what age I was, but I remember reading this book and it fascinating, or maybe, haunting me. That's all I remember, nothing about the story itself, but when I saw it I had a faint rush of awe mixed with fear, and fascination. It now waits for me...it's kinda spooky. Hilarious! Of course, I must now get a flock of ship!! I thought the circle was already complete with the spinning, but no, Kirti, wise woman, you are absolutely correct! wowwee jo! love the wool you've created! green is gorgeous! i like the idea of the annabel with a band of color added. i hope the book (didn't read this one) makes new beautiful impressions for you.